It's time once more for the biggest sports day of the year — Super Bowl Sunday. 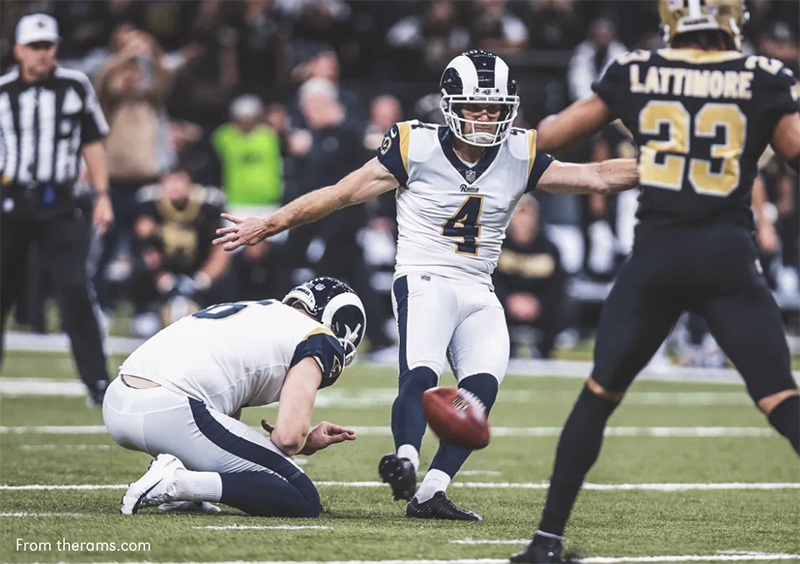 The game between the LA Rams and New England Patriots will feature a fourth UNO graduate to have played in the NFL championship — Rams kicker Greg Zuerlein. Zuerlein — known as “Greg the Leg” — propelled the Rams into the Super Bowl with a 57-yard winning kick in overtime. That came after he hit a 48-yarder with eight seconds left in regulation to force the extra period. And Zuerlein did it all with an aching foot that he injured at halftime stepping on a metal plate near the field surface. He has said he expects to be well enough to kick in Super Bowl LIII. Three other former Mavs also have played in the Super Bowl: Marlin Briscoe, Chris Bober and Chris Cooper. Briscoe was first, helping Miami to a 14-7 win over Washington in Super Bowl VII in 1973. That capped an undefeated season for Miami, still the only NFL team to win all its games. Briscoe was a receiver for the Dolphins after starting his career at quarterback with Denver. In his rookie season with the Broncos he became the first black starting quarterback in pro football history. Briscoe played in the following Super Bowl in 1974, getting two receptions for 19 yards in Miami’s 24-7 win over Minnesota. Chris Bober was the next Mav to play in a Super Bowl, as a lineman for the New York Giants in 2001. The Giants lost to Baltimore 34-7. The fourth former Maverick to play in the big game was Chris Cooper in 2003. Cooper was a defensive lineman for Oakland, which lost to Tampa Bay 48-21. Cooper was credited in the game with a kickoff return for 6 yards. All four Mavericks were native sons, as well: Briscoe and Bober played and graduated from Omaha South High School; Cooper played for Lincoln Southeast and Zuerlein for Lincoln Pius X.